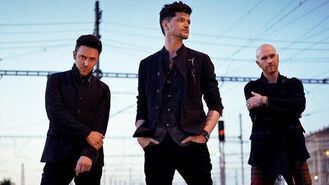 The Irish rockers - Danny O'Donoghue, drummer Glen Power and guitarist Mark Sheehan - said they have some ideas in mind if the Rolling In The Deep singer agrees to a collaboration. "Adele would be great, I'd say, for us. She'll be really cool," Glen said. "She would work with something really stripped-back and organic, just drums and Adele. Just me and her." Mark added: "Adele would be nice. There isn't really anyone else I can think of." The group will release their fourth album, No Sound Without Silence, on September 15, with single Superheroes preceding it on August 31. "Our brand new album, No Sound Without Silence, was recorded on the road. I know we haven't been on the TV and in everyone's faces for about a year because we've been hard at work," Danny explained. The former Voice mentor continued: "We've taken The Script around the world and we spent the past eight or nine months touring America extensively. While we were there, we took a studio bus with us - it's a bus with a recording studio and beds. We wanted to take the energy we normally have live and bottle that." "The time we've been away, we've had time to contemplate about what we want to say to the industry. There is no sound without silence. You can't have anything good to say if you don't think about it first," Danny added. Glen teased it would be better than their previous offerings, including 2012's #3. "Our biggest competition is ourselves. We always try to raise the bar with what we've done already. I don't think we sound like anybody else per se, so we try to be better than we are," he said.